SMP Robotics (http://smprobotics.com) a manufacturer of autonomous mobile robots, presented its S5 Security Robot (Robocom) at ISC Brazil that took place from April 18-20 in Expo Center Norte in São Paulo. 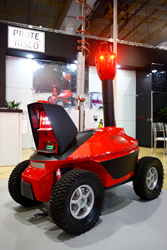 Proterisco, the official distributor of SMP Robotics in Brazil chose the ISC Brazil to introduce the S5 (Robocom) security robot to the 15,000 conference attendees and the leaders of Brazilian security industry. The S5 generated a lot of interest among the conference attendees. Following the conference, the robots received extensive media coverage in Brazil. Security and border control have been important issues for Brazil. According to the Brazilian Association of Security Industries (SIA), the industry grows, on average, 20% per year. The country’s borders are so vast, and the terrain so inhospitable, that attempting to secure them seems virtually impossible. Brazilian Ministry of Defense said in an official statement on November 16th, 2016 that its planning to establish an Integrated Protection Border Program (Programa de Proteção Integrada das Fronteiras) meant to secure the country’s 16,886 km of borders with 10 countries. The program is intended to strengthen the government’s presence in border zones and constantly patrol the area. The S5 autonomous security robots from SMP Robotics have a variety of applications, including patrolling and video surveillance of campuses, vacant properties, manufacturing plants, warehouses and parking lots. The S5 can function in various terrain conditions: road, off-road, grass and gravel and traverse hazardous terrain, carrying out surveillance missions in all weather conditions: rain, snow, fog, smoke, etc., with temperatures ranging from -4F to 100F. The strong surface grip allows the robots to surmount level differences, bumps and ditches. Each robot is equipped with a 360-degree video surveillance system. It consists of six cameras for panoramic observation and a PTZ camera to track objects at larger distances. They can also record, store, send and stream video as well as zoom in and recognize a human at distances of up to 330 feet.